24guesthouse Seoul Station is located in 8 min distance from Seoul station, 10min from airport bus station. Provides the most reasonable price compared to hotels in Seoul and new decorated room with private bathroom, hot & cooling system, TV and Wifi. 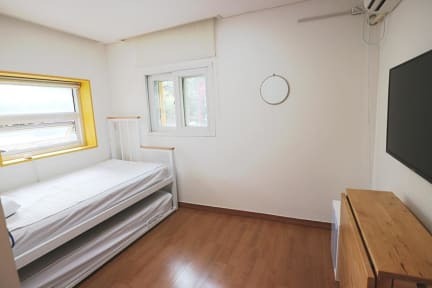 This affordable guesthouse is conveniently located just 5 minutes’ subway ride from Namdaemun Market and a 10 minutes’ subway ride from the popular Myeongdong shopping area. N Seoul Tower is under 10 minutes’ drive and Incheon Airport is a 60 minutes’ drive from the guesthouse. Guests at 24 Guesthouse can utilize the shared living room as well as prepare hot meals at the common kitchen area. Luggage storage is available at the front desk.